The Constitution of the United States of America is the supreme law of the nation. 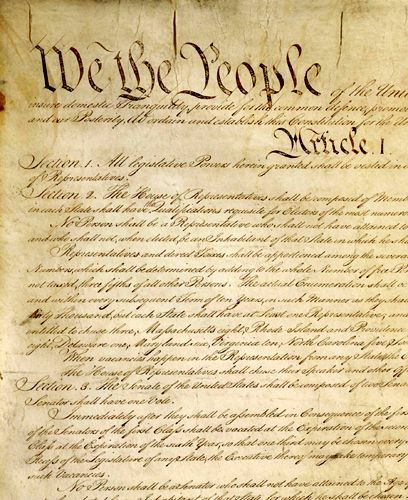 Empowered with the sovereign authority of the people by the framers and the consent of the legislatures of the states, it is the source of all government powers, and also provides important limitations on the government that protect the fundamental rights of United States citizens. 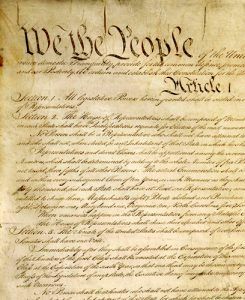 The need for the Constitution grew out of problems with the Articles of Confederation, which established a “firm league of friendship” between the states, and vested most power in a Congress of the Confederation. This power was, however, extremely limited — the central government conducted diplomacy and made war, set weights and measures, and was the final arbiter of disputes between the states. Crucially; however, it could not raise any funds itself, and was entirely dependent on the states for the money necessary to operate. Each state sent a delegation of between two and seven members to the Congress, and they voted as a group with each state getting one vote. But, any decision of consequence required a unanimous vote, which led to a government that was paralyzed and ineffectual. A movement to reform the Articles began and in September, 1786, commissioners from five states met in the Annapolis Convention to discuss adjustments to the Articles of Confederation. After debate, the Congress of the Confederation endorsed the plan to revise the Articles of Confederation on February 21, 1787. Invitations to attend a convention in Philadelphia to discuss changes to the Articles were then sent to the state legislatures. In May, 1787, delegates from 12 of the 13 states (Rhode Island sent no representatives) convened in Philadelphia to begin the work of redesigning the government. The delegates to the Constitutional Convention quickly began work on drafting a new Constitution for the United States. Politicians in secret session,Frank Leslie’s Illustrated 1877. A chief aim of the Constitution, as drafted by the Convention, was to create a government with enough power to act on a national level, but, without so much power that fundamental rights would be at risk. One way that this was accomplished was to separate the power of government into three branches, and then to include checks and balances on those powers to assure that no one branch of government gained supremacy. This concern arose largely out of the experience that the delegates had with the King of England and his powerful Parliament. Three main branches of government were defined, which included the Congressional Legislature, the Senate and a judicial branch headed by the Supreme Court and the powers and duties of each branch specified within the Constitution. All powers not assigned were reserved for the respective states and the people, thereby establishing the federal system of government. 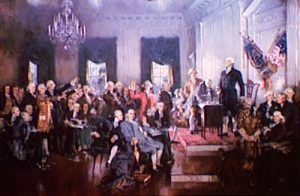 The founders also specified a process by which the Constitution could be amended, and since its ratification, the Constitution has been amended 27 times. In order to prevent arbitrary changes, the process for making amendments is quite onerous. An amendment may be proposed by a two-thirds vote of both Houses of Congress, or, if two-thirds of the states request one, by a convention called for that purpose. The amendment must then be ratified by three-fourths of the state legislatures, or three-fourths of conventions called in each state for ratification. In modern times, amendments have traditionally specified a timeframe in which this must be accomplished, usually a period of several years. Additionally, the Constitution specifies that no amendment can deny a state equal representation in the Senate without that state’s consent. Lincoln’s Constitution quote by E.B. and E.C. Kellogg, 1864. The process set out in the Constitution for its ratification provided for much popular debate in the states. The Constitution would take effect once it had been ratified by nine of the thirteen state legislatures — unanimity was not be required. 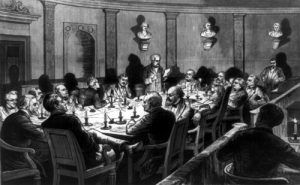 During the debate over the Constitution, two factions emerged: the Federalists, who supported adoption, and the Anti-Federalists, who opposed it. The states proceeded to begin ratification, with some debating more intensely than others. Delaware was the first state to ratify, on December 7, 1787. 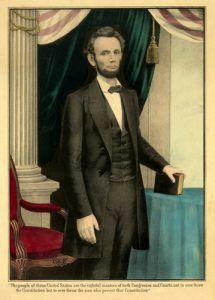 After New Hampshire became the ninth state to ratify on June 21, 1788, the Confederation Congress established March 9, 1789, as the date to begin operating under the Constitution. By this time, all the states except North Carolina and Rhode Island had ratified, but, they too followed, with Rhode Island being the last to ratify on May 29, 1790.